Also, Divertimento for viola and strings; Concerto in E flat; Concertino in E flat; two Sinfonias. Simonide Braconi, viola; Massimo Belli, Orchestra da camera 'Ferruccio Busoni.' Brilliant Classics 94971. 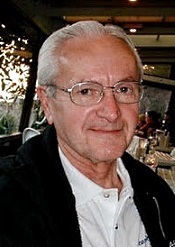 For those you who want to know a little more about Rolla and why he was (and remains) important, Wikipedia tells us that "his fame now rests mainly as 'teacher of the great Paganini,' yet his role was very important in the development of violin and viola technique. Some of the technical innovations that Paganini later used largely, such as left-hand pizzicato, chromatic ascending and descending scales, the use of very high positions on violin and viola, octave passages, were first introduced by Rolla. "He was a musician of European vision, an innovator in his own field who was also able to learn from the best of his contemporaries. Also being so deeply immersed in opera environment undoubtedly had an influence on his style as a composer. 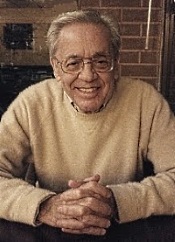 Because of the technical innovations introduced, his work might be considered helpful for the development of viola technique. His style varies from the very melodic phrases, typically operatic in character, rich in fiorituras, to the extremely virtuoso writing, the style we are used to identify with Paganini. This intense virtuosity was a new innovation for viola technique, practically unheard of in previous times. 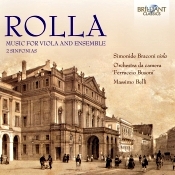 Bertini, a historian of his time, in a dictionary of musicians reported that Rolla was prohibited to play in public because women could not hear him without fainting or being struck by attacks of nerves." At the risk, then, of fainting dead away, let us move on. The first item we find on the program is Rolla's Divertimento for viola and strings, BI330, a brief, two-movement piece that is quite charming. The first movement of the piece is slightly melancholy and fully haunting, beautifully played by the soloists and ensemble. The second (and final) movement is a more lively Allegro that includes some well-executed solo passages. Next, there are the Concerto in E flat for viola and orchestra, BI545 and the Concertino in E flat for viola and strings, BI328. The Concerto is more elaborate than the preceding Divertimento, of course, and more grand in scope, yet it is very Mozartian in nature and style. Its format follows the traditional format of fast, slow, fast, ending in a bouncy tune that Belli and company handle with a touch of merriment. The Concertino is even more flamboyant, and it allows the violist to show off a bit, which Mr. Braconi seems delighted to do. It's fun, the subject matter running the gamut from formal and dignified to happy and cheerful, from sedate, even gloomy, to rhythmically melodic. Finally, we get two sinfonias, the Sinfonia in D, BI530 and the Sinfonia in D, BI531, the former in a revision by Maestro Belli. They are in the nature of twin symphonies, the biggest difference being the presence of a solo violin in BI531 (Lucio Degani, violin). Both sinfonias are brief, under nine minutes apiece, and contain contrasting elements of gaiety and solemnity. Again, Maestro Belli and his players perform with a crisp execution, exacting but with commitment and apt passion. Having never heard this music before, I couldn't tell you if the present interpretations are the ultimate realizations possible. Certainly, they sound well crafted, well played, and expertly presented. If they lack a little something in intangibles like a joyous demeanor, they make up for it in the precision of their attack. The performances are enjoyable, which is really all that matters. Artistic directors Massimo Belli and Simonide Braconi and engineer Raffaele Cacciola recorded the music at the Church of St. Francis, Muggia, Trieste, Italy in September 2013. As we might expect from so small a group of players (about eighteen or so), the sound is sweetly transparent, without being at all bright or edgy. In fact, it appears warm, smooth, a tad soft, and still detailed. The soloists are realistically integrated into the ensemble accompaniment, and a mildly pleasant hall resonance sets everything apart in a most-natural manner. There are, I might add, some extraneous low notes that occur from time to time that seem to be coming either from the instruments or from one or more of the performers or the conductor. I'm not sure what that's about, but, fortunately, it's hardly noticeable. The St. Charles Singers' final concerts of the 2014-15 season will feature famous choral arrangements of folk songs from the British Isles and North America in performances at 7:30 p.m. on Saturday, June 13, and at 3 p.m. Sunday, June 14, at Baker Memorial United Methodist Church, 307 Cedar Ave., St. Charles, Ill.
Over the course of two different concert programs, the acclaimed professional chamber choir, conducted by its founder and music director Jeffrey Hunt, will perform all 25 works from the two-volume collection "Folk-Songs for Choirs." These are traditional songs from England, Scotland, Wales, Ireland, the United States, and Canada, arranged for unaccompanied mixed choir by noted British composers. The volumes were edited by renowned contemporary English choirmaster and composer John Rutter and published by Oxford University Press. The two-concert series, titled "Bushes and Briars," takes its name from one of the songs. The June 13 concert will feature the complete "Folk-Songs for Choirs 1." On June 14, concertgoers will hear "Folk-Songs for Choirs 2." In addition, the St. Charles Singers will perform the world premiere of a newly commissioned work by one of its resident composers, Nathaniel Adams of Chicago. The three-minute piece is an unaccompanied choral arrangement of singer-songwriter Joni Mitchell's "I Don't Know Where I Stand," from her 1969 album "Clouds." The work will be sung at both concerts. Although the English choral tradition has been a cornerstone of the St. Charles Singers' repertoire for decades, this will be the first time that the choir has performed the entire Oxford folk-song series. Single tickets for the June "Bushes and Briars" concerts are $40 adult general admission, $30 for seniors 65 and older, and $10 for students. 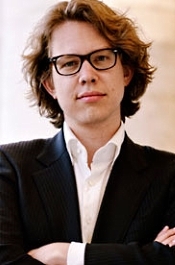 The Music Institute of Chicago Chorale, conducted by Daniel Wallenberg, announces its summer plans, including Dumka, a celebration of Eastern European music featuring an American premiere, June 7 at 3 p.m. and its 12th annual Summer Sing-along Wednesday, July 22 at 7:30 p.m. 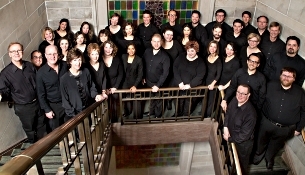 Both events take place at Nichols Concert Hall, 1490 Chicago Ave., Evanston, Illinois. 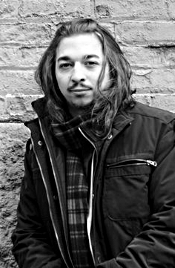 Dumka features the American premiere of "Wedding Songs" by Yuri Butsko. Performing this work with the Chorale are mezzo soprano Laura Boguslavsky and pianists Gregory Shifrin and Irina Kotlyar. The program also includes works by Rachmaninoff, Miškinis, and Dvorák, as well as folk songs from Croatia, Macedonia, Greece, and Georgia. For its 12th annual Summer Sing-along, the Chorale welcomes guest conductor and Music Institute faculty member Frank Winkler, along with soloists Peter Van de Graaff, baritone, and Kathleen Van de Graaff, soprano, to perform a Choral Masterwork Series featuring Brahms's Requiem accompanied by full orchestra. An optional free rehearsal takes place Tuesday, July 21 at 7 p.m. at Nichols Concert Hall. The Britt Classical Festival, led by Music Director and Conductor Teddy Abrams, has announced a wide-ranging, adventurous series of concerts of contemporary and new music paired with core classical repertoire for its three-week 2015 season, beginning July 31. The programs include the world premiere of a folk song cycle written and performed by vocalist and songwriter Aoife O'Donovan and fiddler Jeremy Kittel alongside work by Charles Ives, George Antheil and Copland; performances of John Adams's Absolute Jest string quartet showcase with the Dover Quartet and Samuel Adams' recent work Radial Play; orchestral showpieces including Brahms's Symphony No. 2 and Stravinsky's The Rite of Spring; Teddy Abrams performing on piano and clarinet with his own Sixth Floor Trio, playing music from a variety of genres in a program alongside music by Samuel Barber and Berlioz's Symphonie fantastique; and composer Mason Bates on electronica in his popular work Mothership with the Britt Orchestra, on a program that features James Ehnes in Barber's Violin Concerto. The festival takes place in the Britt Pavilion, an intimate, beautiful outdoor 2,200-capacity amphitheater in the historic Gold Rush town of Jacksonville, Oregon, 17 miles from Ashland. This is Teddy Abrams's second season as the Britt Classical Festival's music director. Carmina burana, with soprano Celena Shafer, tenor Javier Abreu, and baritone Hugh Russell, and members of the San Francisco Girls Chorus, the Southern Oregon Repertory Singers, and the Rogue Valley Chorale. A performance of one of Abrams' own works, Visceral, to kick off the opening night program. An evening of music by Leonard Bernstein, sung by Broadway vocalist Morgan James with the Britt Orchestra, including songs from West Side Story, Wonderful Town, On the Town, and others. An all-French orchestral showcase for The Britt Orchestra, with Ravel's Daphnis et Chloe, Suite 2; Dukas's The Sorcerer's Apprentice; Debussy's Jeux, and Guillaume Connesson's Cosmic Trilogy, Part 1: Aleph. A 20-voice ensemble drawn from the San Francisco Girls Chorus sings in the charming Performance Garden. Two free morning concerts for children, one with percussionist and educator Gabriel Globus-Hoenich. On Monday, May 18th, 2015, at a ceremony at Yale School of Music, Naxos Chairman and owner Klaus Heymann was presented with the prestigious Samuel Simons Sanford Award. Previous winners include Yo-Yo Ma, Mstislav Rostropovich, Isaac Stern, Alfred Brendel, Emanuel Ax, Marilyn Horne, Sherrill Milnes, Aaron Copland, Pierre Boulez, Sir George Solti, Eugene Ormandy and Juilliard President Joseph Polisi. In his citation at the presentation, Robert Blocker, Dean of the Yale School of Music, made reference to both the history of the Sanford Medal, and to the accomplishments of Klaus Heymann and the Naxos group of companies he created. "The Samuel Simons Sanford award is the highest honor the School of Music gives. Let me tell you just a little bit about the significance and history of the Sanford Medal. Not only is it our most prestigious award, but it recognizes and honors a person who was the first Professor of Applied Music at Yale, and one of the founders of the Yale School of Music. A pianist of extraordinary ability, but of modest renown, Sanford was also one of Yale's most generous supporters. Teaching and devotion to musical causes were always close to his heart. 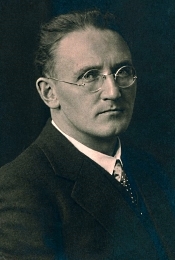 He sponsored musicians' concert tours and students' studies abroad. He was in complete charge of the installation of the Newberry Organ in Woolsey Hall, and he gave the magnificent mace of silver and gold carried in this morning's commencement procession for the University, and his family is also responsible for the Presidential Collar. We honor people who have given distinguished service to music. This morning it is our great pleasure to honor Klaus Heymann. Klaus Heymann is the Chairman of the Naxos group of companies with wholly or partly owned subsidiaries in fifteen countries. The group is the world's leading producer and distributor of classical music." Pianist and conductor Daniel Barenboim has unveiled a new type of piano, which he says is "radically different" to the standard concert grand. It is built with straight, parallel strings, promising a superior sound to a regular piano, in which the strings are installed diagonally. Barenboim launched the instrument at London's Royal Festival Hall, in advance of his Schubert recital series. He intends to perform the entire series on the new piano. Modern pianos have become highly standardized, with few changes to their fundamental design over the last 100 years. They are largely cross-strung, with the bass strings crossing over the middle and treble strings in an "x" pattern, allowing the sound to be concentrated on the centre of the soundboard. Barenboim was inspired to experiment with the design after playing Franz Liszt's restored grand piano during a trip to Siena, Italy in September 2011. On May 21, 18-year-old Yuanfan Yang from the UK (Senior Division) and 15-year-old Jae Hong Park from South Korea (Junior Division) were named First Prize Winners of the 2015 Cleveland International Piano Competition's Young Artists competition. The distinguished jury selected the winners from a field of 25 candidates who performed over a ten-day period. By the close of Thursday's final performances, the competition's jurors were faced with a difficult task, as the finalists delivered exceptional performances of their respective concertos with the Canton Symphony Orchestra and Maestro Gerhardt Zimmermann. On Thursday night, Pierre van der Westhuizen, President and CEO of the Cleveland International Piano Competition, remarked: "For the past 10 days, it has been my privilege and pleasure to work with 25 of the most charming, talented, and dedicated young pianists you can possibly imagine. Their work ethic is astonishing. Their level of skill is jaw dropping. But perhaps most important of all, they are filled with all of the joy for life that one would hope for in teenagers – a fact that I find very, very comforting and uplifting. It is clear to me that the future of classical music is very bright – and safe – in the hands of these talented, and thoroughly delightful, young artists." In addition to cash prizes of $25,000 and $10,000, presented by Zoya Reyzis and the Payne Fund (respectively) – which are among the largest cash prizes of their kind for these age groups - the First Prize Winners will share a debut New York recital at The Frick Collection on August 13. The Institute for Therapy through the Arts (ITA), celebrating 40 years of providing creative arts therapies to children, adults, and families, announces its decision to become an independent nonprofit organization. Operating since its founding as a division of the Music Institute of Chicago, one of the leading community music schools in the United States, the ITA is targeting fall 2015 for this institutional shift. Executive Director Jennifer Rook is optimistic about this development. "ITA is stronger than it has ever been, and we are ready to move forward in achieving our goal to bring the creative arts therapies to more individuals. I look forward to working with our new Board of Directors and Advisory Council as we implement our strategic plan." The decision to establish independence comes at a pivotal time, following the recent successes of ITA's therapy practice. After implementing a three-year strategic plan in 2012, ITA experienced significant growth and made greater investments in programs and staff. In 2014, ITA began billing Blue Cross Blue Shield for psychotherapy sessions provided by creative arts therapists who were also licensed as counselors, social workers, or psychologists, allowing them to serve more clients who previously did not have the means to pay for therapy out of pocket. Additionally, an anonymous donor provided a three-year grant to offset a portion of ITA's operating expenses and invest in new initiatives as the staff worked to achieve a sustainable financial structure. Also, Introduction and Rondo capriccioso; La muse et le poete. Jan Kraybill, organ; Michael Stern, Kansas City Symphony. Reference Recordings RR-136. We have come to expect only the best from Reference Recordings, especially those releases made by their chief engineer and company co-founder Keith Johnson. The present disc is no exception. Now, as I've said before, any time a company records a major repertoire item, it faces stiff competition from dozens, sometimes hundreds, of alternative recordings. 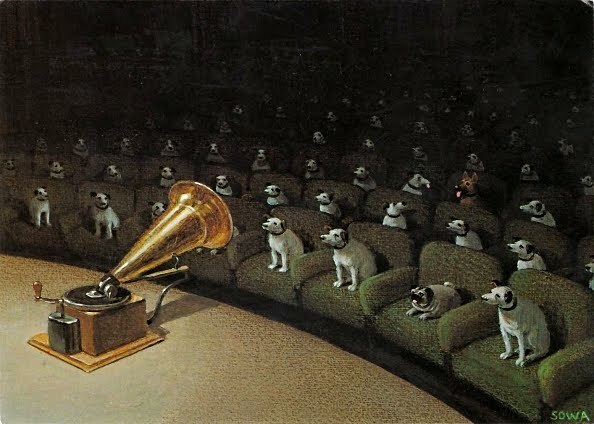 So, to entice a potential buyer, the record company has to offer either a performance of superior quality or sound that knocks your socks off. Preferably both. 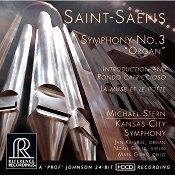 With RR's release of Saint-Saens's "Organ" Symphony, they almost succeed with the former and certainly accomplish the latter. It's another fine Reference Recordings issue. French composer Camille Saint-Saens (1835-1921) said of himself, "I produce music as an apple tree produces apples," by which I suppose he meant he was quite prolific and everything came naturally to him. By the time the Philharmonic Society commissioned him to write his Symphony No. 3 in 1886, audiences already recognized him as the greatest living French composer of his time. These days, we know him particularly for his opera Samson et Dalila, the tone poems in Carnival of the Animals, the First Cello Concerto, the Second Piano Concerto, the Third Violin Concerto, the little Dance macabre, and, of course, the Third Symphony. The Symphony No. 3 in C minor, Op. 78, is a colorful, sometimes bombastic, but thoroughly enjoyable piece of music. Although audiences recognize the piece by its nickname, the "Organ Symphony," the organ really has only a part in the second-movement Adagio and the later segment of the Finale. Saint-Saëns called the work a symphony with organ, and said of it, "I gave everything to it I was able to give. What I have here accomplished, I will never achieve again." It appears he knew what he was talking about (or he was too contrary to go back on his words) because even though he lived another thirty-five years, he never wrote another symphony, organ or otherwise. Anyway, I have to say something up front about Maestro Stern's interpretation of the symphony: Although I like it, it lacks the sheer adrenaline rush of Charles Munch's performance with the Boston Symphony (RCA or JVC), the suave lyricism of Jean Martinon's rendering with the Orchestre National de l'ORTF (EMI or Brilliant Classics), and the overall thrilling and poetic moments of Louis Fremaux's account with the City of Birmingham Symphony Orchestra (EMI or Klavier). That said, Stern holds his own pretty well. Under Stern, the symphony's opening movement is appropriately restless, its familiar theme reworked several times over in various guises and tempos. It leads smoothly into the Poco adagio, which sounds just as serene as Saint-Saens intended (the composer described it as "extremely peaceful and contemplative"). When the organ enters (Jan Kraybill performing on the Julia Irene Kauffman Casavant Organ), it should appear as a huge, warm, gentle wave rolling over us at the beach, and it does. It's a most-refreshing experience, because in some recordings the primary notes are so low the recording barely reproduces them. Here, we actually feel them. In the final movements, Stern allows the music to expand from a relatively controlled opening to an explosive conclusion. By leaving the bulk of the fireworks to the end, Stern builds a cumulative effect, which may not be initially very impressive but leaves one with a satisfying feeling of exhilaration by the time it's over. Oh, and when that organ thunders in at the last, it does so with authority. If you live close to neighbors, keep it down. The disc couplings for the symphony are Saint-Saens's fairly well known Introduction and Rondo capriccioso and the less well known La muse et le poete. Violinist Noah Geller in the Capriccioso and violinist Noah Geller and cellist Mark Gibbs in La muse play some lovely notes, and the orchestral accompaniment sounds flawless. Because Saint-Saens composed the Capriccioso for the virtuoso violinist Pablo de Sarasate, you would figure on its being a vehicle for showing off the soloist's skills, and Mr. Geller is up to the challenge. In Le muse et le poete--a late work (1910) combining elements of a double concerto and tone poem--the violin takes the Muse's part and the cello voices the Poet. This was the first time I'd heard it, and it's beautiful. What a great revelation. Producer and editor David Frost, executive producers J. Tamblyn Henderson and Marcia Gordon Martin, recordist Sean Royce Martin, and engineer Keith O. Johnson recorded the music at Helzberg Hall, Kauffman Center for the Performing Arts, Kansas City, Missouri in June 2013. "Professor" Johnson made the 24-bit recording using his patented HDCD (High Definition Compatible Digital) encoding process. The resultant sound is resplendent and ideally captures the grandeur of Saint-Saens's music. The orchestra displays wonderful dimensionality. We hear it laid out before us in four dimensions: side to side and front to back, with air around the instruments. There is also a great dynamic spread with plenty of punch (meaning it sounds like a real orchestra should sound), a modest distancing, good midrange transparency, and a mild hall resonance to set it all off in a most-natural manner. Most important for the symphony, the organ sounds deep, rich, solid, and clean. As usual with Reference Recordings, this is splendidly lifelike sound, with no artificial enhancement, close-up miking, or editing-console gimmicky. Also, Sarasate: Zigeunerweisen; Tartini: "Devil's Trill"; Ravel: Tzigane, Massenet: "Meditation"; Faure: Berceuse. Anne-Sophie Mutter, violin; James Levine, Vienna Philharmonic Orchestra. DG 00289 477 5721. When SACD came out in 1999, any number of record companies jumped on it, many of them in an effort to repackage some of their older material in the new format. Hybrid Super Audio Compact Discs have, after all, the potential for reproducing multiple channels, not just two channels like regular CDs and, because of their greater storage capacity, reproduce things on the SACD layer in what is theoretically better sound. The discs, as you know, have several layers, enabling them, for instance, to include multitrack SACD recordings and two-channel SACD recordings on a high-density layer and conventional two-channel CD recordings on a separate layer. Such is the case with this 2005 DG release of Anne-Sophie Mutter, James Levine, and the Vienna Philharmonic playing, among other things, Pablo de Sarasate's Carmen-Fantasie. DG initially made the recording in 1992, issuing it in 1993 only on CD in regular two-track stereo. But with the advent of SACD, the company went back into the vaults for the original multichannel tracks and transferred them to this hybrid surround-sound SACD, along with SACD stereo and CD stereo versions as well. But first, the music. Ms. Mutter was a child prodigy who proved herself one of the world's foremost violinists. While she usually tackles things heavier than the material on this disc, it's a pleasure to hear her let her hair down, so to speak. The Carmen-Fantasie is delightful, as are the other popular favorites that accompany it: Sarasate's Zigeunerweisen, Tartini's "Devil's Trill," Ravel's Tzigane, Massenet's "Meditation" from Thais, and Faure's Berceuse. Although Ms. Mutter's account of the Sarasate piece may not display the all-out thrills of Ruggiero Ricci's famous recording with Pierino Gamba and the LSO on Decca (and remastered on JVC), it offers the elegant, refined playing that we have come to expect from her. The only minor snag for some listener's may be DG's actual sound; not the multiple channels (I listened only to the SACD two-channel layer from a Sony SACD player) or the possibly improved SACD audio quality, mind you, but the closeness of the miking. I can't remember hearing a more closely miked DG recording in my life. Combined with a very high output level and some extremely wide dynamics, the disc practically blows you out of your seat until you can run and adjust the volume. Even then, there is no getting around the closeness of the violin. However, this said, I have seldom heard a DG recording with more clarity and definition, either, so maybe there is compensation in all things, as Emerson said. The sonics may not be entirely natural, but they do carry an impact. Unfortunately, the impact comes mainly in the violin parts, because the orchestra sometimes gets lost in the background; nor is there much deep bass response to remind us that they are there. Be that as it may, these are beautiful performances by a totally committed and assured artist, and the Vienna Philharmonic is still one of the world's great ensembles. If I still prefer the accounts of the Carmen-Fantasie by Itzhak Perlman on EMI (coupled with an equally good Paganini Violin Concerto) and with the aforementioned Ricci, it is only because I have enjoyed their recordings for many years and find them comfortable old friends. However, if you have an SACD player, the fun of experimenting with the various modes may be half your entertainment. Whichever way you play the Mutter disc, you'll hear a great violinist enjoying herself with some familiar old chestnuts. Hannes Minnaar, piano; Jan Willem de Vriend, The Netherlands Symphony Orchestra. Challenge Classics CC72672. I wasn't familiar with the Dutch pianist Hannes Minnaar (b. 1984), so I visited his biography Web page, where I found the following information: "Hannes Minnaar received international acclaim after winning prizes at the Queen Elisabeth Competition (3rd prize) and the Geneva International Music Competition (2nd prize). He studied with Jan Wijn at the Amsterdam Conservatory, graduating with the highest distinction and took Master classes with Alfred Brendel, Menahem Pressler and Ferenc Rados. In addition, he studied organ with Jacques van Oortmerssen. "Minnaar was soloist with various orchestras, including the Royal Concertgebouw Orchestra, during which time he worded with conductors such as Marin Alsop, Herbert Blomstedt, Frans Brüggen, Eliahu Inbal and Edo de Waart. He gives recitals in many European countries and around the world. He performed at the Royal Concertgebouw (Amsterdam), Gewandhaus (Leipzig) and Musashino Hall (Tokyo) and was invited to the festivals of La Roque d'Anthéron, Bordeaux (Jacobins), Bahrein and Guangzhou." 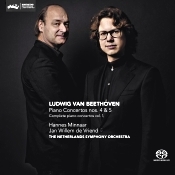 With that in mind, I would add that this release of Beethoven's Piano Concertos 4 and 5 with Maestro Jan Willem de Vriend and The Netherlands Symphony Orchestra would appear to be Mr. Minnaar's fourth recording overall and his first album working with a full symphony orchestra. The results sound generally good, although some idiosyncrasies arise in the performance that may either make the disc a favorite for life or a questionable choice. I found it appealing in several ways, but I'm not entirely sure I'll be returning to it very often. The program begins with Beethoven's Piano Concerto No. 4 in G, Op. 58, which he wrote between 1805 and 1806 (around the same time he wrote the Fourth Symphony and parts of the Fifth Symphony) premiering it in 1807 with the composer himself as soloist. The opening movement is melodic, with the piano part often sounding improvisatory. Beethoven scored the slow movement for piano and strings, keeping it fairly poetic with a slightly agitated orchestral accompaniment, leading quietly into the finale. Then, we get a passionate, tempestuous, rhythmic, stormy, graceful third movement; you name it, Beethoven goes for broke. Minnaar's piano playing throughout both concertos is smooth, fluid, virtuosic, and sweetly lyrical. It sounds particularly effective in the opening of the Fourth Concerto, nicely capturing the autumnal glow of the music while still projecting a good deal of spirit and vivacity. Indeed, the solo parts are most attractive in their soaring lines, which manage to convey a poetic beauty along with their sometimes almost explosive tone. The controversy might come, however, in the speeds the performers adopt. Minaar and de Vriend appear to take Beethoven at his word in terms of tempo, whether the composer intended his metronome markings be taken literally or not. Nor am I sure whether it was Minnaar's decision to play things as fast as they do or Maestro de Vriend's, but, whatever, the relatively quick tempos can be a bit distracting at times, especially in the slow movements. I compared the timings of both concertos to those of several other recordings I had on hand--Wilhelm Kempff, Rudolf Serkin, Vladimir Ashkenazy, Alfred Brendel, Francois-Frederic Guy, Stephen Kovacevich, Leif Ove Andsnes, and others--and found that in almost every movement Minnaar and his accompaniment were faster. Interestingly, the only recordings that took a faster gait were those of Melvyn Tan and Sir Roger Norrington, who play on period instruments in a historical style and, thus, adhere as strictly as possible to Beethoven's actual tempo markings. I can't say I care overly much for Tan/Norrington's "authentic" approach, either, but at least with a period-instrument presentation we expect the brisker pace. Not so with Minnaar and his modern support; instead, it just sounds a little odd. Anyway, minor tempo concerns aside, the performance of No. 4 well captures, as I say, the work's mostly gentle mood swings, and it provides enough energy along the way to keep one interested. Beethoven wrote the Piano Concerto No. 5 in E Flat, Op. 73, "Emperor," in 1809, premiering it in 1811 and dedicating it to the Archduke Rudolf, his patron and student at the time. The piece begins with a big, bravura opening Allegro, the piano entering immediately. In the central Adagio we get one of the Beethoven's loveliest melodies, a brief duet between piano and orchestra. Then, there is a hushed transition into the final Rondo: Allegro, which takes the concerto to a glowing conclusion. Beethoven intended No. 5 to sound monumental, and Minnaar and company supply some decent fireworks. The Adagio loses a little something in sheer beauty, due to the quick pace, perhaps, but the elegance of Minnaar's playing helps mitigate the situation. Then, things end in an appropriate blaze of notes. Producer, engineer, editor, and mastering supervisor Bert van der Wolf made the recording for stereo and multichannel playback via hybrid SACD at the Muziekcentrum Enschede, The Netherlands, in May 2014. I listened to the disc's two-channel SACD layer using a Sony SACD player, although a person can, of course, also listen in two-channel from the regular stereo layer with any standard CD player. The orchestral sound is slightly soft and warm, possibly the result of the mildly reverberant hall used for the recording. The piano appears isolated in front of the ensemble, also sounding just a touch soft and warm. I don't mean this to appear disparaging, by the way; both the orchestra and the piano sound about as they might during a live concert from a moderate distance. Otherwise, detailing is fine, dynamics can be robust, stereo spread is wide, and dimensionality is fairly realistic (with some instruments seeming even farther away than they might sound live). The Monks of Norcia. De Montfort Music - Decca 002315302. Ever since De Montfort Music released a recording of sacred songs performed by the Benedictines of Mary, Queen of Apostles several years ago, the company has been turning out more and more such discs of religious-inspired tunes. 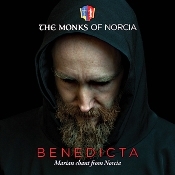 Their latest project is from the Monks of Norcia, and, as anticipated, the singing is very good and the material very old and deeply ingrained in the Catholic faith. Marian antiphons (pieces in a call-and-response style of singing) are a group of hymns in the Gregorian chant collection of the Catholic Church, sung in honor of the Virgin Mary. Here, the Monks of Norcia sing thirty-three such antiphons, including the four in most common usage for the past 700 years: "Alma Redemptoris Mater," "Ave Regina Caelorum," "Regina Coeli," and "Salve Regina." In addition, their repertoire embraces several previously unrecorded chant versions of responsories, plus a work originally composed by the singers. The Benedictine Monks of Norcia are members of the Order of St. Benedict, and their monastery is in Norcia, Italy. The Monks take care of the spiritual, pastoral, and temporal needs of some 50,000 pilgrims from around the world who annually visit the birthplace of St. Benedict and St. Scholastica. And some of the monks sing in a choir, which is where we are here. The entire choir sing most of the pieces on the album, although smaller assemblies and soloists take on a few of the numbers, giving the program a good assortment of music that doesn't easily tire one out. After a brief peal of the basilica's bells, the agenda begins with "Ave Maria... Virgo Serena." As with all of the selections on the program, it sounds cleanly enunciated by the monks, smoothly handled, and enthusiastically nuanced. My only quibble with the numbers is that most of them are so brief, one or two minutes apiece. Still, that can't be helped; these tunes have been around and sung for hundreds of years, and we have what we have, all of it very well rendered. Favorites? Well, the four popular hymns I mentioned above, and also "Regali Ex Progenie" for the strength and fullness of the monks' voices; "Ecce Virgo Concipient" and "Tuam Ipsius Animam" for their refined solo and choir singing; "Gabriel Angelus" and "Concordi Laetitia" for their sweet spirit; and "O Gloriosa Domina" for its free-flowing melody. Now, philistine that I am, I couldn't help wondering as I listened to this album what a mixed choir of the Monks of Norcia and the Benedictines of Mary might sound like. De Montfort, take note. Grammy Award-winning producer Christopher Alder and engineer Jonathan Stokes recorded the music on location at the Monks' monastery in Norcia, Italy. As we might expect from a recording done on location in a church chapel, the sound is fairly reverberant. Not only do we expect it, we desire it. The setting helps transport us to the venue, the hall resonance every bit a part of the presentation as the singing itself. In any case, the room reflections are not so severe as to muffle any of the music, and, indeed, the ambient bloom actually enhances the tunes, giving the choir and soloists a rich, vibrant quality. The voices are clear, well focused, without sounding bright, forward, or edgy. In fact, the voices are warm and rounded, with a lifelike sense of depth to the choir, just as the monks might appear in a live recital. In other words, this is a fine, realistic recording of a choir in its natural environment. The International Piano Academy Lake Como, an exalted institution dedicated to advancing the education of elite student pianists, has formed a partnership with Oberlin Conservatory of Music that will yield an exclusive U.S. home for the Italy-based program. Beginning in fall 2015, three students will be selected from applicants worldwide to take part in the Oberlin-Como Piano Academy, a two-year program of study toward an artist diploma. "Lake Como is a true community of artists and so is a perfect match for Oberlin, where faculty and students come together with a shared commitment to artistic excellence and curiosity to create a vibrant musical world," says Andrea Kalyn, dean of Oberlin Conservatory. Located in a 17th-century palazzo on the shores of idyllic Lake Como, the International Piano Academy Lake Como is considered one of the top piano academies in the world. Founded in 2002, Lake Como is the creation of William Naboré and pianist Martha Argerich. It is dedicated to nurturing the development of young pianists regardless of financial resources or country of origin. Lake Como's relationship with Oberlin came about through the academy's interest in working with a major American conservatory. Impressed by the performances of pianists participating in Oberlin's annual Cooper International Competition and by the conservatory's piano faculty, Naboré sought out Oberlin to be that U.S. home. The partnership was cemented during a spring-semester visit to Oberlin by Naboré. The Festival's second season welcomes world-class classical teaching artists and exceptional students to Miami July 5 through August 2, 2015. Celebrated American soprano Deborah Voigt opens the 2015 Miami Summer Music Festival in a robust program of traditional dramatic fare including Wagner, Strauss and musical theater alongside the MSMF Symphony Orchestra, a 95-piece orchestra comprised of top young talents from the world's elite music institutions including Juilliard, the Royal College of Music, the Cleveland Institute, Oberlin, and more. Voigt will follow up her concert conducting a master class with select young MSMF Opera Institute singers and a book signing of her recently released memoir, Call Me Debbie: True Confessions of a Down-to-Earth Diva. After a groundbreaking inaugural year to critical acclaim, Miami Summer Music Festival's impressive sophomore season features four opera productions with orchestra including Mozart's Don Giovanni, Britten's Albert Herring, Massenet's Cendrillon, and a family production of Humperdinck's Hansel and Gretel. Orchestral programming includes Mahler's Symphony No. 5, Strauss's Ein Heldenleben, and culminates in a return to South Beach's acoustic and aesthetically stunning New World Center for a collaborative all-festival program of Stravinsky's Rite of Spring, favorite opera highlights, the Piano Concerto Competition winner, and more. Richard Egarr, called "eminently entertaining" by The New York Times, returns to Philharmonia Baroque Orchestra this November to lead Bach's most beloved orchestral works: the Brandenburg Concertos. Acclaimed as the music director of the Academy of Ancient Music, Egarr showcases Philharmonia's talented orchestra. Bach's enduring music illuminates the unique colors of Baroque harpsichord, oboes, flutes, and hunting horns. The best seats are already selling out! Or call (415) 295-1900 to learn more about subscribing. 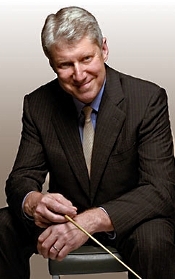 Kenneth Woods has been appointed Artistic Director of the Colorado MahlerFest. He is only the second Artistic Director in the festival's 28-year history and succeeds Founding Artistic Director Robert Olson. 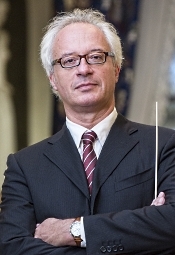 Woods will oversee his first festival, MahlerFest XXIX, in May 2016. Of his appointment, Woods remarks, "I'm thrilled and humbled to be invited to steer Mahlerfest and the ongoing exploration of one of the greatest composers of all time. I've always been impressed by the sophistication of MahlerFest's programming and presentation, not to mention the musical standards attained by its participants. 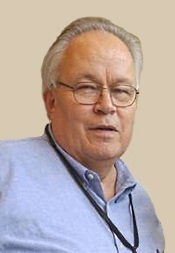 I must extend enormous congratulations to Bob Olson for everything he has achieved. The complexity and scale of some tasks can only be fully appreciated once you've done them yourself, and as someone who has put together a few crazy Mahler projects of my own over the years, I know something about the kind of heroic effort Bob has made to build and sustain this festival. I take very seriously my responsibility to keep the torch he has lit blazing brightly for many years to come." Founded by conductor Robert Olson in 1988, the Boulder-based Colorado MahlerFest is an annual celebration of the life and music of Gustav Mahler. Throughout one week every May, the festival explores Mahler through symposia, exhibits, films and the performance of a major symphonic work by the composer. MahlerFest is currently in the midst of its third cycle of Mahler's symphonic compositions. In 2005, MahlerFest received the Gold Medal of the Vienna-based International Gustav Mahler Society, an honor so far bestowed on only one other American organization, the New York Philharmonic. South Shore Conservatory's Duxbury Music Festival (DMF) presents its tenth anniversary season, with exciting DMF faculty and student performances, and family-friendly events, from July 17 through July 31. The 10th anniversary season of Duxbury Music Festival features a captivating back story. Organizers are celebrating the return of renowned founding educators/musicians, pianist Oxana Yablonskaya and conductor/cellist Dmitry Yablonsky. When the two celebrated musicians tried to emigrate from the former Soviet Union to the United States in 1977, they were blocked from obtaining a visa. Thanks in part to an ambitious petition organized by famed American composers Leonard Bernstein and Stephen Sondheim, and a long 2-year wait, the two made their way to the U.S., finding considerable success, and becoming part of Duxbury Music Festival's rich foundation and history. Their return to celebrate the Festival's first decade prompted a celebratory season in their honor, with repertoire consisting primarily of Russian compositions, as well as an opening concert featuring the music of Sondheim and Bernstein. This celebrated program for solo and chamber instrumental performance unique to all of New England, a program of South Shore Conservatory. Over the years, more than 21,000 people have attended 128 Duxbury Music Festival performances, including 63 free concerts enabled by a army of more than 2000 volunteers dedicated to making the Festival a success. Students helm from the world-over, including gifted musicians from Israel, China, Japan, Korea, Azerbaijan, France, Spain, Switzerland, Russia, Canada, and Taiwan. Tickets for all events are available beginning June 1. A variety of series subscriptions are available for purchase starting May 25. DMF is a program of South Shore Conservatory (SSC), with an office at SSC's Duxbury campus at the Ellison Center for the Arts, 64 St. George Street, Duxbury, 781-934-2731. For more information or to purchase tickets, visit www.duxburymusicfestival.org, call 781-934-2731, ext. 23, or follow Duxbury Music Festival on Facebook. Kirshbaum Demler & Associates, Inc. Announces New Company Name: Kirshbaum Associates Inc.
Shirley Kirshbaum, Founder and Director of Kirshbaum Demler & Associates Inc., announced that the company has completed a process of change and restructuring. This new name, with accompanying redesigned logo and Web site, affords the company the opportunity to revitalize its mission and serve the arts moving forward. Ms. Kirshbaum said, "We hope that these changes will enhance our effectiveness in supporting the creative ventures and remarkable artists we are privileged to represent, with increased passion and enthusiasm." The new leadership team consists of Shirley Kirshbaum, Founder and President; Peri Stedman, Vice President and Director of Artist Services, and Jason Belz, Vice President, Artist Manager and Director of Booking. Collectively they account for over 75 years of service to our industry. Kirshbaum Associates Inc. looks forward to continuing to provide the best services to our artists, our projects and our respected colleagues. Nicolas McGegan's Philharmonia Baroque projects recently includes Rossini's first staged opera, La cambiale di matrimonio (The Marriage Contract). Nic and the orchestra also introduced music by Salamone Rossi in one of their popular SESSIONS concerts with insightful repartee and multimedia presentations. Then in January and March, Nic's two programs with the Pasadena Symphony included works of Peter Maxwell Davies, Poulenc, and Brahms, and a program of Rameau, Mozart, and Beethoven. Nic is conducting an all-Haydn program at the Virginia Arts Festival; Acis and Galatea in New Haven's International Festival of Arts & Ideas with the Mark Morris Dance Group; an all-Beethoven program and a program of Telemann, Boccherini, Bach, and Rameau at Aspen Music Festival; Mozart, Schubert, and Beethoven at Caramoor International Music Festival with Orchestra of St. Luke's; Handel and J.C. Bach with the Cleveland Orchestra at the Blossom Music Festival; and Copland's Appalachian Spring, Poulenc's Organ Concerto, and many other exciting works at the Hollywood Bowl with the Los Angeles Philharmonic. Nic will lead the Adelaide Symphony's Mendelssohn Festival; visit the New Zealand Symphony for Messiah; conduct a program of Haydn, Mozart and Leclair at the BBC Scottish Symphony Orchestra; make his annual appearance with the St. Louis Symphony for a program of Gluck, Mozart, and Haydn; and conduct and record the American premiere of La Gloria di primavera, a Scarlatti opera that has not been heard for 300 years, with Philharmonia Baroque Orchestra. Transmusica - "Resounding Hope Through Music"
Also, Sinfonia Concertante for Four Winds. Per Flemstrom, flute; Birgitte Volan Havik, harp; Pavel Sokolov, oboe; Leif Arne Pedersen, clarinet; Per Hannisdal, bassoon; Inger Besserrudhagen, horn. 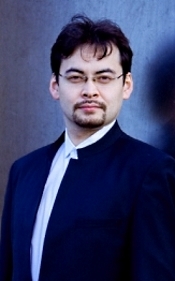 Alan Buribayev and Arvid Engegard, conductors; Oslo Philharmonic Orchestra. LAWO Classics LWC1071. The Flute and Harp Concerto is one of the most charming things Mozart ever wrote. It always surprises me that more artists don't record it. 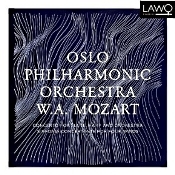 Still, there are plenty of good recordings of it to choose among, and this one from flutist Per Flemstrom and harpist Birgitte Volan Havik with Alan Buribayev conducting the Oslo Philharmonic takes its place among the best. It's a lovely work, given a lovely performance. The Sinfonia Concertante for Four Winds as a coupling is like icing on the cake. Mozart wrote his Concerto for Flute, Harp and Orchestra in C Major, K. 299, in 1778, and, interestingly, it's the only concerto he wrote that includes a harp. Given that people back then still considered the harp an unusual instrument, there wasn't much of a repertoire for it as yet, and listeners found Mozart's combination of flute and harp rather unique. Anyway, my own favorite recording of the concerto is the one featuring Jean-Pierre Rampal and Lilly Laskine on the Erato label, which is neither here nor there except to say that the pairing of Flemstrom and Havik does not suffer by comparison. Maestro Buribayev and his Oslo players maintain an expressive musical demeanor throughout the concerto, and the soloists play with grace and finesse. Above all, this concerto needs a relaxed, flowing gait, and that's exactly the way Buribayev leads it, taking a cultured, refined approach yet one with a positive, pleasing countenance, too. As I say, it's a lovely performance, with an especially beautiful slow movement in which the performers bring out all of the music's most-shimmering, radiant qualities. In addition, we get Mozart's Sinfonia Concertante for Four Winds in E-flat Major, K. 297B, (for oboe, clarinet, horn, bassoon, and orchestra, originally written in 1778 for flute, oboe, horn, bassoon, and orchestra). Somehow, the version we usually hear today (and the one this disc) substitutes a clarinet for the flute, as well as including other changes, leading some scholars to doubt K. 297B's authenticity. Whatever, we have what we have, and the soloists and orchestra on the present recording do a fine job with it. For the Sinfonia we get an entirely different set of soloists, of course, but also a different conductor, Arvid Engegard. Whatever, the work sounds happy enough, and the soloists are all quite good at their jobs. OK, I thought Buribayev might have brought a slightly greater sense of exuberance to his part of the show than Engegard does, while Engegard follows a bit more-exacting course. Still, the final Andante con variazoni comes off with more than a little pizzazz and makes a fitting ending for the program. Producer Vegard Landaas and engineers Arne Akselberg and Thomas Wolden recorded the music at the Oslo Concert Hall, Oslo, Norway in November 2012 and January 2013. They made the album for hybrid SACD playback, so you have the choice of two-channel stereo or multichannel playback using an SACD player or two-channel stereo from a standard CD player. I listened to the disc's SACD layer in two-channel stereo. The sound appears extremely well balanced in terms of left-to-right stereo spread and overall frequency response. No part of the range stands out as too bright or too dull, and the solo instruments appear well integrated into the rest of the ensemble, not too far forward from the rest of the orchestra. The dynamic range seems a little restricted, and there isn't a lot of impact involved, but that's perhaps as it should be with this kind of music. Bass and treble extensions are also a bit limited, and midrange transparency is only moderate. Nevertheless, it's a fairly natural sound, coming through pretty much as one would hear this music in a concert hall from a modest distance. Also, trumpet concertos of Handel, Torelli, and Vivaldi. Roger Delmotte and Arthur Haneuse, trumpets; Hermann Scherchen, Vienna State Opera Orchestra. Westminster 471 276-2. This was another of Universal's reissues of a decade or so ago, taken from the old Westminster label. It features Handel's Water Music recorded by Hermann Scherchen and the Vienna State Opera Orchestra in 1961. It is a decidedly and wonderfully old-fashioned interpretation by today's standards, yet it's one a person might not want to miss. In the booklet notes we find a quote from the conductor regarding the then-emerging move toward "authentic" performing practice: "All that can be said here is that historical fidelity for fidelity's sake would be absurd, given our large concert halls and the vast audiences that fill them; the modern concert hall demands the piano, just as it demands today's more powerful strings." Apparently, Maestro Scherchen had little regard for small ensembles playing Baroque music on period instruments. Instead, he offers a large-scale performance playing in a most Romantic tradition, some of which can be downright disconcerting to folks who have grown up with period-performance practices. Scherchen takes the "Overture" and "Alla Hornpipe," for instance, at ooooh soooooo sloooow a pace, and with such a mass of strings you may hardly recognize things. Still, taken purely as music, without counting prejudices one way or the other about what music it is and how one should play it, this set of Water Music holds its own. Scherchen presents it beautifully, the orchestra performs it eloquently, and the whole set of movements appears uniformly well integrated. Once you listen to it all the way through, today's newer, leaner, quicker-paced readings may seem less musical to you. Performers today most commonly divide the Water Music into suites according to key signatures, but as there is no documented proof as to how folks originally played the various movements, Scherchen has chosen to offer them in a single, extended suite. It works just fine, as does the early stereo sound. Unlike a previous release I reviewed from this source (of Liszt), which Westminster recorded several years earlier than the Water Music and sounded noisy, this issue is dead quiet. Fortunately, too, like the Liszt, the orchestral spread is wide and deep, the sonics rich, full, and smooth, and the natural balance remarkable. Indeed, the audiophile listener may find interest in this disc for its audio reproduction alone, with the older performance style coming as an added attraction. 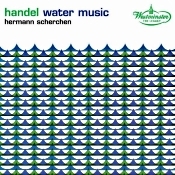 As the Water Music also comes coupled with several very brief trumpet concertos by Handel (Concerto in D major), Torelli (Sinfonia for trumpet, strings & continuo in D major), and Vivaldi (Trumpet Concerto for 2 trumpets, strings & continuo in C major), I can only recommend the package; certainly not as a first choice in this repertoire, but as an alternative view at least. Music of Michael Vincent Waller. Various artists. XI Records XI 136 (2-disc set). Not a lot of recent modern music--that is, music of the past thirty or forty years--appeals to me. Too often it sounds like mere academic exercises in noise shaping rather than anything that might entertain people. Indeed, the very thought of "entertaining" an audience would seem anathema to many modern composers; after all, that would smack of pandering to popular taste, something no respectable modernist would want critics to accuse them of. Then, just when I think that future generations will remember little from our current classical era, along comes a young composer like Michael Vincent Waller who breaks with the prevailing tide and produces serious music with a genuinely wide appeal. It's kind of refreshing. According to his Wikipedia article, "Michael Vincent Waller (b. 1985, Staten Island, New York) is an American composer of contemporary classical music. He has studied with La Monte Young, Marian Zazeela, and Bunita Marcus. His recent compositions have been compared to Erik Satie, Claude Debussy, Maurice Ravel, Keith Jarrett, and Morton Feldman blending elements of minimalism, impressionism, gamelan, world music, and melodic classicism. His piano works have been described as 'evoking Debussy but refracted through a 21st century prism.'" Certainly, the music on his two-disc set The South Shore--solo and chamber works--fully illustrates these characteristics. More important, the compositions entertain both the mind and the heart. Waller's music, at least as represented on this two-disc set, sounds melodic and a touch melancholy yet never sentimental. The program derives from compositions he wrote in the past four years, music that evokes memories, emotions, vaguely nostalgic and yearning, always sweet and flowing. The musicians and ensembles who perform on the disc include Christine Kim, cello, and Pauline Kim-Harris, violin (Project SiS) with Conrad Harris, violin, Daniel Panner, viola, Charity Wicks, piano; Dedalus Ensemble with Didier Aschour, electric guitar, Amélie Berson, flute, Cyprien Busolini, viola, Thierry Madiot, trombone, Pierre Stéphane Meugé, alto sax, Deborah Walker, cello; 20>>21 Ensemble with Yael Manor, piano; Itay Lantner, flute, Erin Wight, viola, Clara Kennedy, cello, and Jessica Park, violin; Nicolas Horvath, piano; Esther Noh, violin; Carson Cooman, organ; Katie Porter, clarinet, and Devin Maxwell, gong percussion (Red Desert); Luna Cholong Kang, flute; and Marija Ilic, piano. Being the old Romantic that I am, I tended to favor the more lyrical numbers in the set, starting at the beginning with Anthems for cello and piano. Like most of the pieces, it's brief and to the point, about two-and-a-half minutes, with a graceful beauty that envelops one in its welcoming tone. Likewise, Atmosfera di Tempo for string quartet is a gentle set of variations, quite beautiful in its wistful longing. Waller describes Profondo Rosso for piano trio as a Valentine for his muse, Mia. As with any Valentine, it is pure, loving, and ultimately comforting. And so it goes. Each piece has a haunting quality, moody and atmospheric, delightful in the moment, quickly forgotten. The pieces invite repetition of those moments, however. Tre Pezzi per Trio di Pianoforte for piano trio is probably the most impressionistic music in the set, with shadings of light and dark colors interweaving to create visions of nature, the seasons, and memories sad and anxious. After that, there's a wonderfully evocative piece for organ called Organum that recalls music of the late Medieval-early Renaissance period in a large, airy, but very quiet cathedral. It's quiet organ music, if such a thing is to your liking; it is mine. Ritratto is the largest-scale work on the program, written for a sextet of flute, alto sax, electric guitar, viola, cello, and trombone. Again we hear a kind of Renaissance quality in the music, especially with the entrance of the guitar. It's quite charming, with each instrument highlighted for its own individual contribution to the whole. 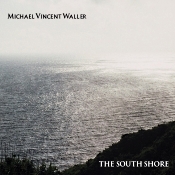 The title piece, La Riva Sud ("The South Shore," of Staten Island, close to the composer's birthplace) for piano and viola involves memories of Waller's childhood. As such, it is among the most reflective and nostalgic of the works in the set. Some of the pieces may remind you of the flute playing of Paul Horn, others of the piano of George Winston, two musicians who influenced a generation of popular artists. Yet Michael Vincent Waller's music is more complex than that, richer, subtler, and more varied. I could go on, but you're getting the idea. Of course, none of the music would be of value if the musicians didn't play it well, and each of the artists involved plays with feeling and conviction. It's a lovely album all the way around. Is Waller's music of such a quality as may become truly classic, music that people might play a hundred and more years from now? Who knows? Personally, I doubt it. Yet it is positively enjoyable in the moment, which is all that counts for us today. Equally significant, it is music that one hopes presages more good things from the composer, who is young enough to be a serious force in the world of original, avant-garde classical works. Producers Michael Vincent Waller, Ryan Streber (who also did the mixing and mastering), and Christine Kim plus a variety of audio engineers made the recordings at several studios and a couple of live venues, XI Records releasing the album in March 2015. Although the sound derives from a number of different sources, it's all basically of a kind: warm, mildly resonant, moderately close up, and slightly soft in keeping with the nature of the tunes. Also, Lyric Pieces. 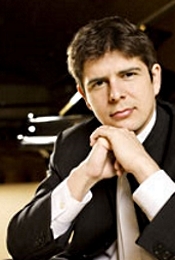 Javier Perianes, piano; Oramo Sakari, BBC Symphony Orchestra. Harmonia Mundi HMC 902205. In the event you didn't know, Javier Perianes (b. 1978) is a Spanish concert pianist, who has won any number of prizes and played with many of the world's leading orchestras and conductors. Although he has done over half a dozen solo albums, he has recorded only a couple of pieces with orchestra. This disc of the Grieg Piano Concerto with Maestro Oramo Sakari and the BBC Symphony Orchestra is one of them. To be fair, however, he still goes it alone in the accompanying Lyric Pieces for solo piano. Norwegian composer Edvard Grieg (1843-1907) wrote his Piano Concerto in A minor, Op. 16, in 1868, his first and only piano concerto. Odd, perhaps, given that Grieg was also a pianist. Anyway, with its wonderfully big opening moments and hints throughout of Norwegian folk music, the concerto quickly became one of the staples of the piano concerto repertoire. The first movement opens with a famous and dramatic timpani roll, complete with cascading crescendos from the piano. Perianes captures the theatrical effect of these flourishes with energy galore, and, indeed, the whole of the first movement follows closely the excitement set out in the beginning. Tempos remain moderate; intonation is well nuanced; transitions, as into the second subject, are smooth and fluid; and Perianes seems always attentive to Grieg's designs. The performance, in essence, is as big as they come, and Harmonia Mundi's close-up miking makes it seem all the bigger. Thus, if it's a grandiose reading you're looking for, this one is as massive and ambitious as they come. 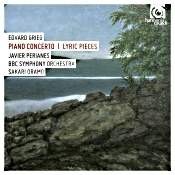 As I say, Perianes attacks the opening Allegro with vigor, practically banging the keys through the floor. And Maestro Sakari and the BBC Symphony accompany him with a flawless vitality of their own. For a coupling, Perianes gives us eleven of Grieg's Lyric Pieces for solo piano. It is a good representative sampling of these little works, of which Grieg wrote sixty-six over a period of some forty years. Here again Perianes displays his softer, more-sensitive side, each piece sparkling. These are very Romanic, melodious works, which the pianist carefully executes with a straightforward delicacy and refinement. There is no hint of sentimentality about his playing. Still, when the occasion calls for an energetic virtuosity, as in "The March of the Trolls," he is on top of the situation. As a pianist Perianes can be both exciting and poetic, qualities that serve him well. Producer Ann McKay and engineer Neil Pemberton recorded the Concerto live at the Barbican Centre, London in October 2014, and producer Martin Sauer and engineer Tobias Lehmann recorded the Lyric Pieces at Teldex Studio Berlin in June 2014. As with most live recordings, the engineers miked the concerto quite close up, especially the piano, which looms very large, practically in one's face. The orchestra, too, seems much too close, making for excellent detail and impact at the expense of its picking up some midrange brightness and edge. Fortunately, the producers edited out any applause, and audience noise is practically nil. Still, one gets a rather one-dimensional presentation, with good left-to-right stereo spread but almost no depth, air, or room ambience. The solo piano pieces, however, sound excellent, with a slightly more distanced perspective and more room resonance to give the instrument a greater natural warmth. 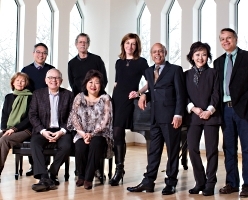 Washington Performing Arts unveiled its 2015/16 season, an expansive line-up of classical and world music, jazz, dance, and community engagement that underscores both the organization's history as an important incubator of talent and its refreshed vitality as it heads into its 50th year. At the heart of the season's offerings is the collaborative spirit among artist, presenter, and community that is Washington Performing Arts' calling card. The 60 performances in nine venues feature favorite performers, rising stars, rich residencies, new partnerships, intriguing programmatic threads, and new works and commissions. Moving out of the concert hall and into the community, the unique Embassy Adoption Program will undergo a major expansion and join forces with the Kronos Quartet in a new five-year collaboration. The Capital Arts Initiative continues to bring vital arts programs to the D.C. Public Schools, and the year-old Mars Urban Arts Initiative fuels joint planning between Washington Performing Arts and grassroots neighborhood artists, local businesses, cultural institutions, and local residents. Subscriptions are on sale at WashingtonPerformingArts.org or by phone at (202) 785-9727. We're pleased to share with you the 2014 PARMA Anthology of Music, a resource for students, instructors, performers, and ensembles to discover new, programmable, and performable works by young and emerging composers from all over the world. Established in 2012, the PARMA Anthology of Music recognizes and brings attention to these composers, these creators of phenomenal and innovative works, new amalgamations of styles and genres, new conceptions of form and structure, and new methods of expression and execution. Selected through the PARMA Student Composer Competition, the ten works featured in this Anthology are written for brass quintet. Additionally, we would like to extend a warm congratulations to the Grand Prize Winner of the contest which yielded this collection, Michael Mikulka. Michael's piece To Throw is an inspired and finely honed work which builds to a point of precise repetition, and represents not only the quality of works submitted to the Competition but also the fearlessness with which so many modern composers approach their work and art. As the Grand Prize Winner, To Throw was premiered at the 2014 PARMA Music Festival by the Redline Brass Quintet on stage at The Music Hall in Portsmouth NH. Music Director Nadja Salerno-Sonnenberg and New Century Chamber Orchestra conclude the 2014-2015 season May 28-31 with the West Coast premiere of Murmurations by Featured Composer Derek Bermel. Commissioned by a New Century-led consortium of ensembles, including the Saint Paul Chamber Orchestra, River Oaks Chamber Orchestra of Houston and A Far Cry of Boston, Murmurations explores the collective behavior observed in flocking formations of starlings and the similarities of visual and aural unity between performers. Discussing the themes of his work, Derek Bermel states, "When I listen to and watch a string orchestra play, I'm reminded of a flock of birds. Visually and aurally, the performers seek unity on many levels -- attention to tuning, tone, clarity of rhythm, consistency and pressure of bowing. They glide and dive in formation, soaring together or splitting into layers of counterpoint before regrouping into a single unit." Also featured on the program is Stravinsky's Pulcinella Suite arranged for string orchestra and Schubert's String Quartet in D Minor, D. 810, Death and the Maiden, arranged for string orchestra by Mahler. The program will be given on four evenings in different locations around the Bay Area: Thursday, May 28 at 8 p.m., First Congregational Church, Berkeley, Friday, May 29 at 8 p.m., First United Methodist Church, Palo Alto, Saturday, May 30 at 8 p.m., SF Conservatory of Music, San Francisco and Sunday, May 31 at 5 p.m., Osher Marin JCC, San Rafael. New Century offers an Open Rehearsal Tuesday, May 27 at 10 a.m., Kanbar Performing Arts Center, San Francisco for a price of only $8. The Open Rehearsal will offer a sneak preview of the concert repertoire, while allowing audiences to experience the musical democracy of a rehearsal without a conductor. Single tickets range in price from $29 to $61 and can be purchased through City Box Office: www.cityboxoffice.com and (415) 392-4400. Discounted $15 single tickets are available for patrons under 35. Open Rehearsal tickets are $8 general admission and can be purchased through City Box Office: www.cityboxoffice.com and (415) 392-4400. Beginning June 30, 2015, Courtney Beck, Philharmonia's current Associate Executive Director, will succeed Michael Costa as the Acting Executive Director at the Orchestra. Courtney has worked at Philharmonia for more than eight years, first as Director of Development and, for the last two years, as Associate Executive Director. During her time at Philharmonia, she has completed two successful fundraising campaigns, launched SESSIONS, the Orchestra's new alternative format concert series, strengthened and grown the Board of Directors, and helped to set the organization's strategic direction. Michael announced that he would be stepping down to the Board of Directors in March saying, "After six years at the Orchestra and with the coming end of a five-year fundraising campaign and strategic plan, this was the right time and a natural end. It has been an extraordinary six years and I leave Philharmonia with the knowledge that we have accomplished a great deal. I have enjoyed being a part of such an extraordinary musical family - Nic, Bruce, and our musicians, our audience, supporters, board and staff. Knowing that Courtney would succeed me made this decision even easier. She is the right leader to move Philharmonia ahead in the coming year." Thomas Sondergard, BBC National Orchestra of Wales. Linn Records CKD 462. If the number of releases in the CD catalogue is any indication, Sibelius's first two symphonies remain his most popular, with No. 2 taking a slight edge. 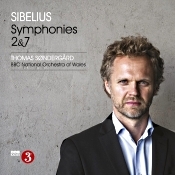 This is no doubt why most conductors begin their Sibelius symphony recording cycles with one of the first two works, which is what Maestro Thomas Sondergard and his BBC National Orchestra of Wales do here, giving the Second a fairly lively, and welcome, reading. With room left over, the little Seventh Symphony is also a welcome delight. Finnish composer Jean Sibelius (1865-1957) wrote his Symphony No. 2 in D, Op. 43 in 1902, and the listening public quickly dubbed it his "Symphony of Independence," although no one is sure whether Sibelius really intended any symbolic significance in the piece. Even so, it ends in a gloriously victorious finale that surely draws out a feeling of freedom and self-reliance from the music. The piece begins in a generally sunny style, though, then builds to a powerful a climax, with a flock of heroic fanfares thrown in for good measure. Sondergard takes all four movements more quickly than do the conductors on any of the half dozen recordings I had on hand for comparison, yet his tempi are not at all breathless. Indeed, his handling of the faster sections of the first movement is fleet and agile, the change-ups smooth and entirely natural. When he pauses momentarily, when he increases the volume, when he goes into a hushed whisper, or whatever, it is with purpose; and that purpose always seems to be in the service of the music. With evenly tuned transitions from warm to cool and back, Sondergard's interpretation places the first movement among the best you will find. The second movement Sibelius marked as an Andante (moderately slow) and ma rubato (with a flexible tempo) to allow conductors more personal expression. The movement begins with a distant drumroll, followed by a pizzicato section for cellos and basses. Under Sondergard this slow movement is appropriately somber, yet he imbues the music with a degree of comfortable affection, too, so it's not entirely melancholy. And again, Sondergard ensures that when he reaches the intense middle section, it doesn't appear to be coming out of nowhere but is intrinsic to the rest of the music. Sibelius makes the third movement a scherzo, one that provides a dazzling display of orchestral pyrotechnics, interrupted from time to time by a slower, more melancholy theme. The whole thing should bounce around from an admirable liveliness to a more pastoral theme, then a stormy midsection, and a tranquil conclusion. This fast movement is sort of the opposite in structure of the preceding movement: instead of two slow sections enclosing a fast one, we get two fast sections surrounding a slow one. Sondergard generates a good deal of enthusiasm throughout this segment, keeping both the orchestra and the audience on their toes. In closing, the final movement bursts forth in explosive radiance--both thrilling and patriotic. When the third movement glides directly into the fourth, Sondergard might have increased the horsepower just a bit more, highlighting the heroics. Instead, he is content to let the music speak effortlessly for itself, and perhaps he was right in doing so. He makes a rather eloquent statement by eschewing a certain degree of exaggeration. In the final analysis, Sondergard's treatment of Sibelius's Second Symphony is one of the best (and best sounding) you'll find. Completed in 1924 the Symphony No. 7 in C major, Op. 105, was Sibelius's final published symphony. It is notable for being in a single, relatively brief movement. For its first performance, he called it Fantasia sinfonica No. 1, a "symphonic fantasy." It was only a year later, when he actually published it, that he decided he would simply call it his Symphony No. 7. Whatever, the composer said he wanted to express in it a "joy of life and vitality with appassionato sections." To that extent, Sondergard takes him at his word. One movement or not, the music flows structurally as a symphony might, just with more seamless continuity and cogency. Sondergard's rendering of it is, frankly, gorgeous, one of the most brilliant, moving performances I've heard. As with the previous work, the conductor fashions it all of a piece, with nothing that doesn't perfectly belong. And throughout all of this music, the orchestra adds a rich, polished luster to the proceedings. It's quite becoming. Producer and engineer Philip Hobbs recorded the symphonies in stereo and multichannel at BBC Hoddinot Hall, Ckardiff, UK in March 2014. Linn Records released the hybrid SACD for both SACD stereo and multichannel and regular CD stereo playback. I listened to the SACD two-channel stereo layer. The sound has a nice airy quality, with a lifelike dimensionality about it. You can hear the orchestra not only from side to side in a realistic spread but front to back as though actually sitting in the audience in a concert hall. This is typical, though, of Linn Records, who usually do their utmost to make listeners feel as though the event were live and the ensemble were actually there in front of you. Dynamics, frequency response, impact, and overall clarity are also quite good, with the hall itself lending a modest resonance to the occasion.